Venerupis philippinarum (syn. Ruditapes phlippinarum) is an edible species of saltwater clam in the family Veneridae, the Venus clams. Common names for the species include Manila clam, Japanese littleneck clam, Japanese cockle and Japanese carpet shell. This clam is commercially harvested, being the second most important bivalve grown in aquaculture worldwide. The shell of Venerupis philippinarum is elongate, oval, and sculptured with radiating ribs. It is generally 40 to 57 millimeters wide, with a maximum width of 79 millimeters. The shell is quite variable in color and patterning, being cream-colored to gray with concentric lines or patches. Individuals living in anoxic conditions may be black. The inside surface of the shell is often white with purple edges. The siphons are separated at the tips. This clam is native to the coasts of the Indian, Philippines and Pacific Oceans from Pakistan and India north to China, Japan, and the Kuril Islands. It has a very wide nonnative distribution, having been introduced accidentally and purposely as a commercially harvested edible clam. It is now permanently established in coastal ecosystems in many parts of the world. It is common along the Pacific coast of North America from British Columbia to California, where its original introduction was accidental. It can be found in Hawaii. It was first seeded in the waters of Europe in the 1970s, and there have been multiple introductions throughout the region. It has spread naturally in Western Europe over the decades, its adaptability allowing it to thrive in many coastal habitat types. It has been planted in Portugal, Spain, the United Kingdom, Italy, Germany, Morocco, Israel, and French Polynesia for the purposes of aquaculture. This burrowing clam is most abundant in subtropical and cooler temperate areas. It can be found in shallow waters in substrates of coarse sand, mud, and gravel. It lives in the littoral and sublittoral zones. It burrows no more than about 10 centimeters into the substrate. It sometimes lives in eelgrass beds. This species lives in many types of habitat, being found in the intertidal zone, brackish waters, estuaries, and under ice. It survives in a range of salinities and temperatures, with narrower ranges required for breeding. 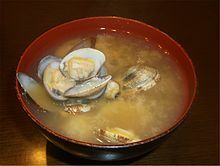 Miso soup made of Japanese littleneck clams (Asari). This clam may become sexually mature in its first year of life, when it reaches about 15 millimeters in width, especially in warmer areas such as Hawaii. In cooler areas it begins breeding at older ages and larger sizes. In warmer regions it spawns year-round, but only in the summer in cooler areas. The fecundity of the species increases with size, a 40-millimeter female producing up to 2.4 million eggs. The larva, a trochophore, begins to develop a shell 2 days after it hatches from the egg. Within 2 weeks it settles onto a hard substrate, attaches to it with a byssus, and eventually burrows into the sediment. Its maximum life span is about 13 to 14 years. The clam filter-feeds through its siphon, taking mostly phytoplankton, with adults preferring microalgae such as diatoms. It may be an opportunistic feeder, its diet varying according to what is available in its wide range of habitat types. This species is a nutritious and attractive prey item for many kinds of predatory animals, including the green crab, moon snails, starfish, fish, ducks, shorebirds, sea otters, and raccoons. It is a host species for the copepod Mytilicola orientalis, a parasite of mussels which is known as a pest in aquaculture operations. This clam has had negative impacts on native ecosystems in some regions, mainly due to its ability to grow in high densities. Its populations can begin filter-feeding at such rates that they can alter local food webs. It can hybridize with the grooved carpet shell (Ruditapes decussatus), a phenomenon that has led to introgression. Wikimedia Commons has media related to Venerupis philippinarum. This species represents 25% of commercially produced mollusks in the world. This clam is considered to be a sustainable aquaculture product. It is sold live or frozen. ^ a b Gofas, S. (2014). Ruditapes philippinarum (Adams & Reeve, 1850). In: MolluscaBase (2017). Accessed through: World Register of Marine Species on 2017-05-22. ^ Cohen, A. N. 2011. Venerupis philippinarum. The Exotics Guide: Non-native Marine Species of the North American Pacific Coast. Center for Research on Aquatic Bioinvasions, Richmond, California, and San Francisco Estuary Institute, Oakland, California. Revised September 2011. ^ a b c Cordero, D., et al. 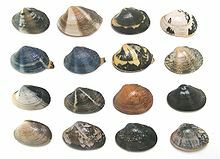 Population genetics of the Manila clam (Ruditapes philippinarum) introduced in North America and Europe. Nature: Scientific Reports 7, Article number: 39745. 3 January 2017. ^ Morris, R.H., Abbott, D.P., & Haderlie, E.C. (1980). Intertidal Invertebrates of California. Stanford, CA: Stanford University Press. ^ a b c d e f g h i j k Fofonoff P. W., et al. Venerupis philippinarum. National Exotic Marine and Estuarine Species Information System (NEMESIS). Accessed 22 May 2017. ^ Carlton, J. T. (Ed.) (2007). The Light and Smith Manual: Intertidal Invertebrates from Central California to Oregon. University of California Press. ^ a b Ruditapes philippinarum. Fisheries and Aquaculture Department, FAO. 2017. ^ a b c d Palomares, M. L. D. and D. Pauly (Eds.) Ruditapes philippinarum. SeaLifeBase. Version February 2017. ^ Study: Non-native Manila clam has established in Mission Bay, San Diego. Sea Grant California. 30 March 2015. Milan, M. et al. Transcriptome sequencing and microarray development for the Manila clam, Ruditapes philippinarum: genomic tools for environmental monitoring. BMC Genomics 2011 12:234. Talley, D. M., Talley, T. S., and Blanco, A. Insights into the Establishment of the Manila Clam on a Tidal Flat at the Southern End of an Introduced Range in Southern California, USA. PLoS One 2015; 10(3): e0118891. This page was last edited on 7 April 2019, at 23:10 (UTC).